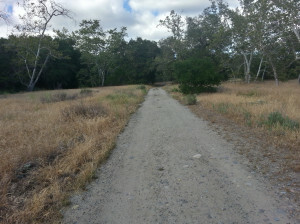 Though there are various places to access this wonderful yet lengthy Orange County trail, a personal favorite is at the intersection of Rancho Santa Marguerita Parkway and Alicia Parkway. Unfortunately there’s no convenient place to park at this intersection. 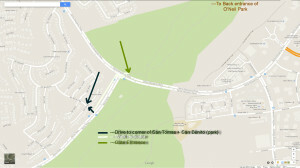 Your best bet is to park on the corner of San Tomas and San Benito Way as you can see from this map below. Walk down San Benito Way and head east toward the aforementioned intersection. Once at this intersection, use the cross walk button to safely walk across Alicia. 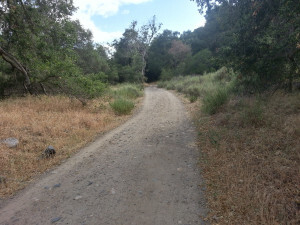 Then repeat the process to cross Rancho Santa Marguertia Parkway. 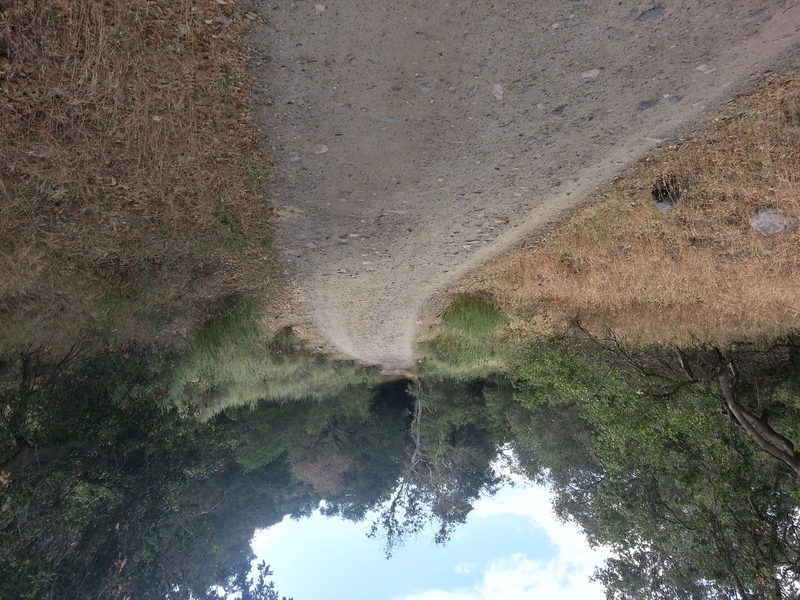 At this point you can walk up the brief but steep dirt trail and follow around to Arroyo Trabuco sign (photo below) or walk down the concrete driveway and in through the open gate to the Arroyo Trabuco sign. As local residents know, this is Mountain Lion, Bobcat and Rattlesnake country. Bring necessary gear as needed (walking poles, pepper spray, etc.) and be mindful of posted signs. 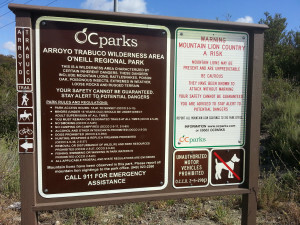 The land is owned and managed by OC Parks. 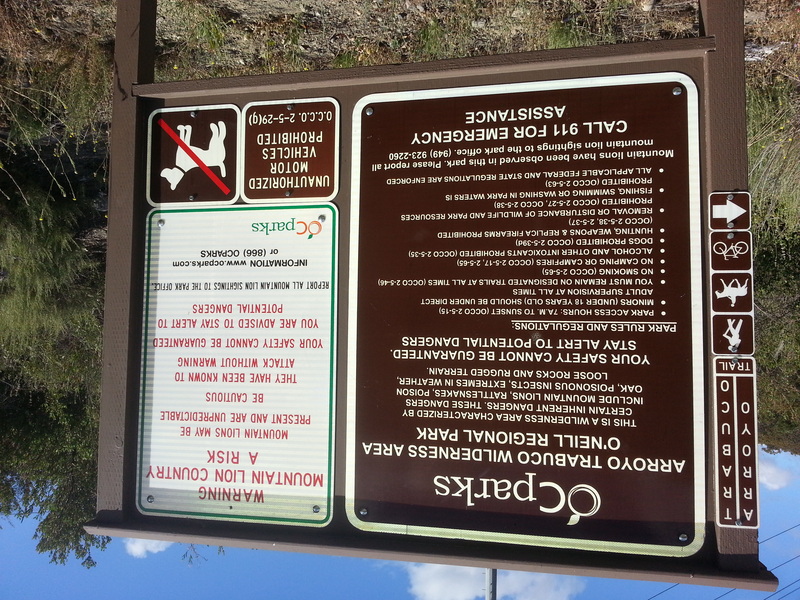 Once you pass the Arroyo Trabuco Wilderness sign keep heading down the path. If you bear left you’ll soon cross a creek and find yourself heading east toward the back end of O’Neill Park. It’s a level easy walk (nothing strenuous). Your first and only intersection will be just past the creek. if you opt to take this trail its not too long. There’s a slight uphill and you’ll be able to overlook the main trail below. This upper trail ends at a housing cul de sac. It is scenic and worth doing at least once. if you opt to avoid this left turn and head straight towar O’Neill there’s loads of Oak Trees, Sycamore Trees and some of the common birds you’re likely to see are Nuttall’s and Acorn Woodpeckers, Northern Flickers, Red-tailed and Red-shouldered Hawks, Cooper’s Hawks, House Wrens, various finches, Phainopeplas and various other common round residents. In spring I’ve seen Pacific-slope flycatchers, Black-headed Grosbeaks and Western Tanagers. This is a brief list so do keep an eye out of course for other species and feel free to post your sightings on the mainpage of this site..
Of final note is if you opt to bear right just past the entrance sign, you’ll be heading west and walking underneath Rancho Santa Margarita Parkway as your first indicator. 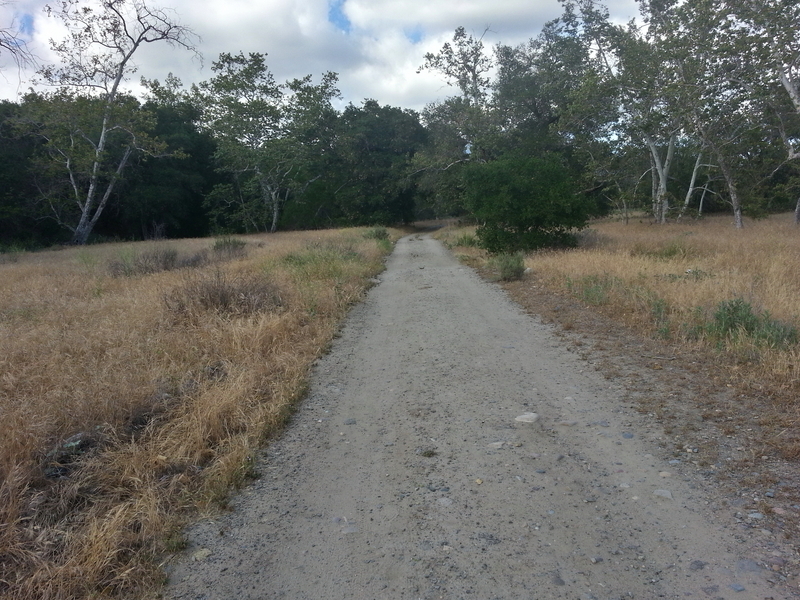 The trail in this direction is lengthy and extends for several miles through open and also thick tree areas. over the years this portion of the trail has changed and is forever changing whenever heavy rains pass through our area. In this direction depending on time of year I’ve seen Ash-throated Flycatchers, White-tailed Kites, Oak Titmice, and of course some of the others mentioned above.